Should I be a developer or a tester if I decide on an IT career? Will my career growth be just as good either way? What should I say when someone asks me ‘why QA’? Am I wasting my time being a QA when I could have been a developer? Is my job less secure if I am a QA? I am being assigned a QA project, should I run the other way or is there anything in it for me? Am I going to be insignificant as a tester? Does all credit go to developers when the product hits the market? Isn’t testing supposed to be for those who are non-technical? Testing is less intense and I am only willing to work part-time, would that be reason enough for me to try it? Why Software Testing is a Tough Job? And, one of the top FAQs we get – “Is QA a monetarily wise career choice? Aren’t testers paid less than development counterparts?” Let’s find out. #1) Testers don’t need as many skills as developers do – False. Why? #3) Will growth opportunities be similar for Testers and Developers? #4) Are developers indispensable while testers are not? #5) Finally, is the disparity in compensation true? 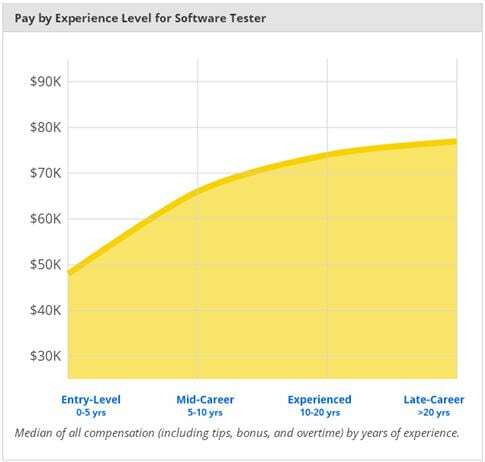 Do developers really make a lot more than testers? All developers test and most testers write code. We are not just talking Unit and Integration tests here. Tools such as Selenium use the same IDE and programming languages used for development so testing can be set up fast and easy. Test Driven Development and behavior driven Development frameworks are on an all-time rise. This simply means that developers have to think from the perspective of the end users/testers. They need the perspective and assistance of testers to set up these frameworks. See these posts for more details Automation Testing Using Cucumber Tool and The Difference Between TDD and BDD. There are many such instances where the boundaries of testing and development cross over. Bottom line: Cross-functional knowledge is a MUST. Both teams play critical roles end to end. With companies adopting Continuous integration and continuous testing approaches, testers and developers work hand in hand. Also, Agile does not differentiate between development and test teams- it's all one SCRUM. Growth is variable to each person as it depends on ability, aspiration, efforts, and circumstances. It has little to do with the branch of IT. Developers could move on to become managers, Business Analysts, Architects, or could go into sales, research etc. depending on their qualification, aspiration, and opportunities. The same chances exist for testers too, just in their field. Test lead, Test manager, Business Analyst, etc. – many possibilities. Also read => How to Figure Out What QA Job Best Suits You Based on Your Skills? If a certain department is not important, why have it? Developer versus tester conflict though is no longer a problem within IT teams, it is still a clichéd cultural perception among outsiders. An almost reverence towards developers and disdain for testers is still heard of – but I bet this is coming from those who know neither disciplines well. To be or not to be (a software tester) – is a question, not to be answered based on the opinions of the unaware. Jobs are volatile everywhere. It is usually the weakest link that takes the cut, and it does not mean it is always the QA that is discarded. When you look at the above links please note that there are many variables. Unfortunately, we don’t work in a world of normalized salaries. In my career, I've seen many QAs earning more than the Development counterparts. And vice versa is also true in many cases. A job offers more than money – An opportunity to exercise your potential, a community that shares your passion and a chance to make a difference. Let the big picture show all this and more. Hunt for a lion, not a unicorn. Beware of the urban myths – A friend of a friend who bagged a killer salary package and had even less experience than you did. Comparing salaries – (with QAs or Devs) – Not a good idea. If you feel overworked and underpaid, feel free to discuss it with your manager. Anything that is worth doing is worth getting paid for, well. Lastly, “To double your income, triple your rate of learning.”- Robin Sharma. In closing, I want to say that choosing a career path should be based on aptitude, ambition, security, satisfaction and of course, compensation. At work, one must feel competent, confident and productive. Being good at what you do is the key to feeling that way and you know that it’s not a state magically conjured. It takes work, practice and more practice. Author: Thanks to STH team member Swati S. for all the research and making us proud of our profession. We would love to hear your thoughts, comments, questions and disagreements below. A really wonderful article and very well written! A very good reference guide for a person, who is trying to change his profile from development to testing or vice versa. great…!! It’s a great article. it has resolved my all the doubt. Thanks for that article. However, I respectfully disagree with all of your assertions. In my opinion, I believe that with the shift-left phenomenon, testers are becoming more like Developers. As time goes by, testers need the ability to learn how to code in order to keep their jobs. For example, at my current job, we don’t accept any Tester that does not have coding abilities. Therefore, we no longer accept just manual testers. That trend is happening in many companies. Many companies are now looking for what is known as Software Development Engineers in Tester. Basically, developers that write tests. Hence, the emphasis is on development skills with a testing background. Being just a pure manual tester is no longer sufficient and that position will fade out over time. Finally, I believe that at some point, the Developers will do their own coding and testing. Why not, when they are the ones that know application the best and the code the best. THey just need to understand that the burden of testing lies on them and not the QA. Once that mental shift happens, manual tester is gone. Take for example Microsoft where there are no more manual testers. Most of the developers write and test their own code. In conclusion, I believe that all manual testers need to work towards becoming SDET’s or their position will slowly die out. Of course it will take many years, especially in the government industries that are so slow to progress. But it will happen, in my opinion. very well explained and deeply researched. Good reference guide for me, who is trying to change her career (or to start After long break) from development to testing. @Nikolay Advolodkin: Thank you for taking the time to respond to us. We appreciate your inputs. You are right about testers and developers becoming SDET and that is our point too. That is why we have listed common skills in point 1. However, testing is not going to get extinct. The way it might be done will change and as you say, slowly, but the traditional methods are going to evolve. It’s a nice article with lots of supportive links. Seems, Software testers job becomes tougher in coming days, specially for manual testers. One needs to enhance his/her skills with automation to survive. I agree with the point that you will be paid as per your skills. Even in our organisation QA are paid even more than Development. What about manual tester who dont code ? How do we do the comparison of them with Dev. At the same time i think automation is not testing as automation is development. Its about how many good scenarios you can write rather than how much code you can write to run them. When you develop/automate something its purpose is positive. But when you test you want to break. There is one big difference: To get testers is much harder than production code coders. There is no testing study path (only certifications). Supply and demand – less testers means more money. @Gaurav Khurana: Thank you for being a wonderful, regular reader and I am glad to know you agree with me. Really very important things which is you mentioned, I am also a tester, It helped me a lot to improve self in this field. There is a lot of fuss about testing and test management; BECOMING TEST PROFESSIONAL IS A CAREER BLUNDER, please don’t get into this trap if you want to build a career, if you want a job for your survival this is a good option!!! 1. Developers vs tester ratio : More developers but less testers therefore few job opportunities. 2. Less salaries and few onsite opportunities. (testing is outsourced, Compare the billing rates for SAP or Oracle Fin or Cloud Computing or Analytics vs Testing), billing is quite low therefore less salaries; there may be few people who earn more than developers those are very few i would say one in thousand!!! 3. Easy to replace, therefore easy layoff. 4. Treated as supporting team, secondary treatment therefore less annual hikes. 5. Easy to come to a career end: keep learning new tools again and again; in Dev if you learn and work J2EE or .NET it is for life time or for 15 to 20 years at least. In the last 10 years several tools came into market and replaced by others Winrunner to QTP and to Selenium and other commercial tools or ETL testing even though clients are skeptical about the ROIs; recently mobility test automation comeon how much you can learn!!! 6. you will be frustrated when people who passed out 5 to 6 years after you pass out from the college talk about new and cutting edge technologies that change the world – such as cloud, big data, digital or great ERP and and their implantation, because you always get a chance to see the UI but can not architect the same. 7. People who worked as dev architects can go for start ups, bcz thy aware about technology as well as business; but as a tester you may be aware of the business but not the technology and its implementations. 8. This is most important point: In long run, if you would like to go into Senior management companies prefer managers with development background to the mangers from testing background. So guys if you are with less than 5 years work exp in testing, this is the right time to jump into Development otherwise you will regret for the life time!!! if your work exp is more than 5 years, accept your destiny and drag your feet!!! Those who are looking for S/W testing carrier can trust this information, comparison is almost near to the actual trend in the IT market. hi i m b.tech graduate fresher in this field . manula or automation which one is best . so that i should continue in that particular testing . I heard that Testers get more onsite oppurtunities. Development is generally outsourced, and then after the finished software is ready to be tested, clients want the testers to be present at the client side. According to me developer and tester have equal opportunities, yes some when it comes to job securities developer have the edge compare to tester. I currently do software testing in a large corporation that contracts for the government. Yes, you need software programming skills of some kind otherwise how are you going to communicate well with the developer on what to do? I know VB.NET and SQL and Python. Co-worker who does it knows C#/C+, Pearl, and SQL. hello…thank you all…it helped me a lot… but I’m really interested in game tester..so how could that be?? Now I have been hearing from many people that software testing has no growth compared to development..
could anyone please clear it to me..? And also now.. I’m in doubt that does game tester is also same as software testing..?? I started my SDET position with no development skills. I think it allowed me to really learn coding, along with that “Quality”. I often think that I should have been a developer first before I can become an SDET. But I find that to not always be true. An SDET is a developer, and coding is required skill to have in order to be good SDET! Really this is very nice blog posting thanks for sharing your informative article with us.